Cabramatta's huge all-day food court specialising in Southeast Asian street food. A modern, local riff on the hawker market concept, District 8 is Cabra-Vale Diggers' 600-seat food precinct, promising your tastebuds a trip down the Mekong River, without the flight to Southeast Asia. Here, a diverse lineup of restaurants and food stations delivers authentic flavours from across Vietnam, Thailand, China, Laos, Cambodia and Myanmar. You can drop in for a classic Malaysian-style seafood laksa, dive into a big bowl of Hanoi-worthy pho, carb-load on some Asian baked goods, or round up the crew for a proper dim sum feast. The $9.99 weekday specials also includes some pretty tasty dishes, including Monday's char siu pork and a barbecue Cantonese duck each Thursdays. Meanwhile, loud and lively Chinese restaurant Horizon is a favourite for its daily yum cha offering, as well as the hefty selection of fresh seafood tempting the dinner crowd each night. 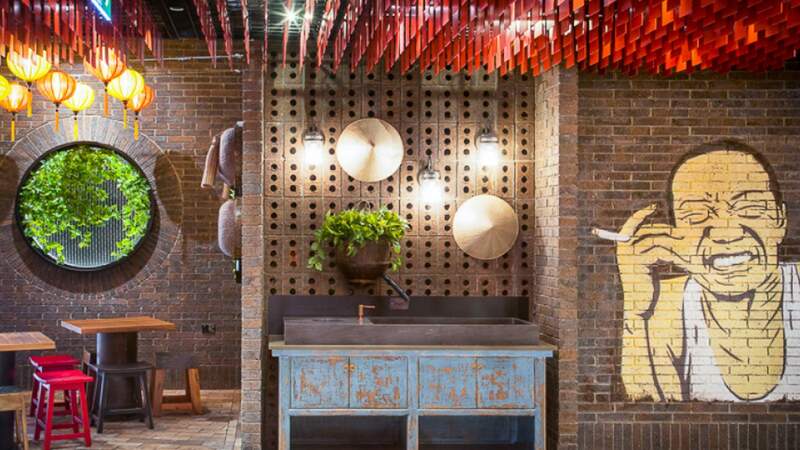 To match District 8's real-deal culinary offering, expect a fitout that wholly embraces those Southeast Asian roots throughout, from the wall of authentic maneki neko 'waving cats', to the thousands of red timber squares, hanging Chinese-style from the ceiling. If you're well practised in the art of devouring tasty Asian fare, you've also got the chance to win big with District 8's current pho challenge, which runs from September 13 until October 25. If you manage to conquer the super-sized 2.2 kilogram bowl ($30) of meat, aromatic broth, rice noodles, bean sprouts and other additions solo, you'll score a $50 District 8 voucher. Successful contestants will also go through to the November 1 pho-slurping grand final, where the main prize is a huge $1,500 travel voucher. Best bring your appetite though — this mega bowl's the equivalent to three regular-sized phos.